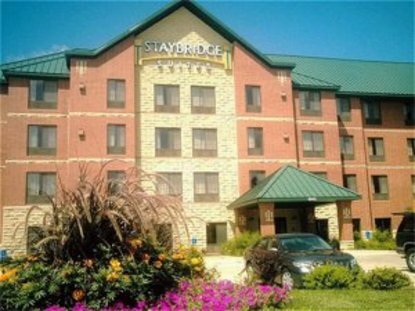 Staybridge Suites West Des Moines is an all suite extended stay hotel located in West Des Moines IA. Whether you're relocating or just traveling through, we offer spacious and comfortable accommodations to suit your needs. We are located directly off of Interstate 80, exit 121, just 2 miles north of the Jordan Creek Town Center and approximately a 12 minute drive to downtown Des Moines and the Des Moines International Airport.While you're our guest, you'll enjoy our complimentary hot breakfast buffet, indoor pool and hot tub, fitness center, business center, on site laundry facility, 24-hour Bridgemart convenience store, and Tuesday through Thursday complimentary Sundowners Reception. We have one 950 SF meeting room to accommodate your small meeting.Each suite includes such amenities as cable TV, VCR, sofa bed, refrigerator and microwave, hairdryer, iron and ironing board, coffee maker. Our one bedroom suites include a full kitchenette. We offer complimentary high speed wireless Internet and daily newspaper so you can stay in touch.We're conveniently within 2 miles of the Corporate offices of Wells Fargo, Marsh McClennan, Briggs Corporation, Hyvee, the Farm Bureau, and North American Hy-Line International. Our location puts us in easy access to the downtown headquarters of Principal, Allied, Nationwide Insurance, WalMart, and Blue Cross Blue Shield. This hotel is committed to providing accessible facilities under the American Disabilities Act. If your accessibility needs are not met, please contact the Hotel Manager on Duty. Should you require additional information regarding accessible facilities for guests with disabilities, please call 1-800-Holiday (U.S. and Canada) or contact the hotel directly. For the hearing impaired, TDD service is available at 1-800-238-5544 within the U.S. and Canada.